Some musicians are desperate to court controversy. They make self-conscious attempts to get under the skin of a target deemed a threat or make otherwise inflammatory comments about a bigger presence in their genre. On the other hand, there are musicians who do little to fan the flames as it were, but still carry labels such as ‘trouble-maker’ and ‘notorious’ like an albatross around their neck all because of a little honesty. Aron ‘Deuce’ Erlichman certainly falls into the second category. 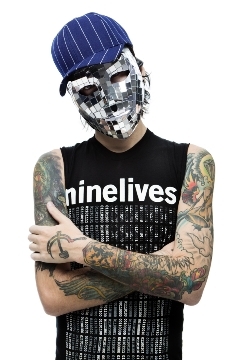 Leaping like a tattooed wrecking ball as the mastermind of masked rap-rock crew Hollywood Undead, Deuce went from nowhere to everywhere after the success of debut album, Swan Songs. Despite the success, all was not well within the … Undead camp and soon after he left under an acrimonious cloud followed by a hailstorm of back-biting and trash-talking from his ex-band mates.